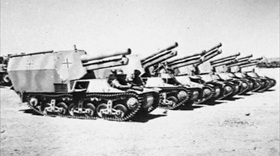 Mont­gomery was blessed with numer­i­cal supe­ri­ority in men and partic­u­larly equip­ment after the arrival of Spit­fire air­planes, 6‑pounder anti­tank guns, and Amer­i­can-built M4 Sher­man tanks with their turret-mounted 75mm high-velocity gun cap­able of pene­trating the armor of any Ger­man tank. Rom­mel, pushed back into Italian-held Libya, made a stand at El Agheila (Al-‘Uqaylah) on the Gulf of Sidra in Novem­ber and Decem­ber 1942, but he was even­tu­ally out­flanked. Since re­treating from Egypt, Rom­mel’s Afrika Korps (or Panzer­armee Afrika, as it was now called) had lost roughly 75,000 men, 1,000 guns, and 500 tanks. 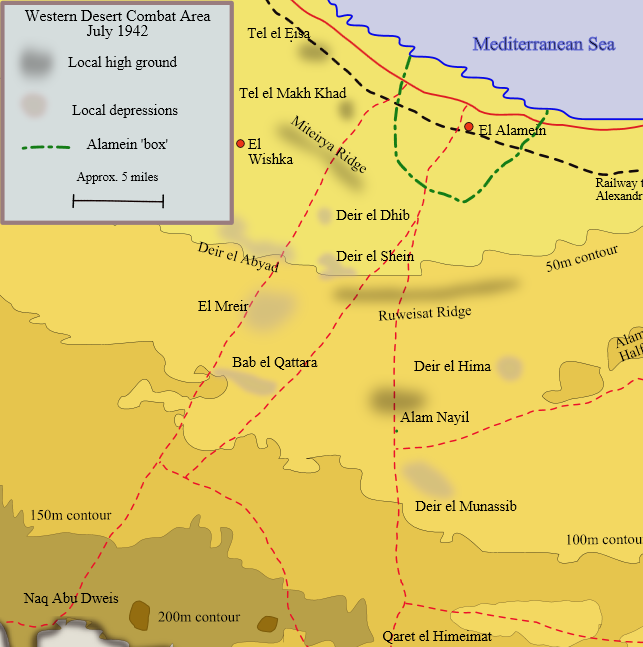 His army was bested south of Tripoli (at El Buerat) at the end of Decem­ber, but the Desert Fox succeeded in evacuating the remnants of his forces to Tunisia in January 1943. The Anglo-Amer­i­can Torch landings in neigh­boring Algeria and further east in Morocco the previous Novem­ber dashed Rom­mel’s plans to go on the offen­sive and con­soli­date the Ger­man hold on Tunisia. By mid-1943, all remaining Ger­man and Ital­ian forces in North Africa—some 250,000 strong minus the invalided Rom­mel—were swept up into Allied cap­tivity. The Ital­ian barn door as it were stood wide open, beckoning the Allies to begin their next operation, Operation Husky (July 10 to August 17, 1943), the invasion of Europe. Left: PzKpfw IIIs (Panzerkampfwagen IIIs) of Rommel’s 21st Panzer Divi­sion advance with infan­try sup­port in Egypt in this photo from circa May 1942. On August 31, 1942, they led the assault to out­flank Brit­ish posi­tions during the Battle of Alam el Halfa, but by then Mont­gomery’s Eighth Army was suffi­ciently equipped to repulse them, ending Rommel’s lightning advances in the Western Desert. 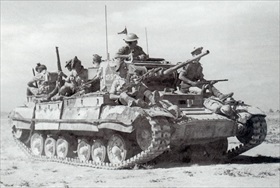 Left: A British-built, two-man-turret Mk3 Valen­tine tank in North Africa carries Scottish infan­try­men. The Valen­tine tank was exten­sively used in the North African Cam­paign, but it shared the com­mon weak­ness of Brit­ish tanks of the period: its 2‑pounder gun lacked high-explosive (anti­per­son­nel) capa­bility, and it soon became out­dated as an antitank wea­pon, too. By 1944 the Valen­tine had been almost com­pletely replaced in Euro­pean frontline units by the Churchill (Infantry Tank Mark IV) and the U.S.-made M4 Sherman tank. 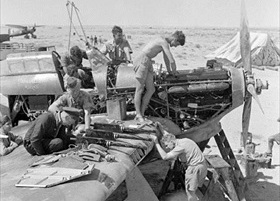 Right: Maintenance work being carried out on a Hawker Hurri­cane during the Brit­ish defense of Tobruk, Libya, 1941. The Hawker Hurri­cane was the Allies’ most use­ful aircraft in North Africa owing to its dura­bility, an attri­bute very impor­tant in harsh desert con­di­tions. The Hurri­cane played mul­tiple roles in North Africa: photorecon­nais­sance, patrolling, fighting, and bombing. 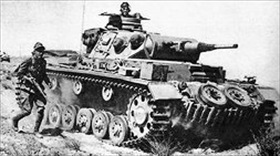 The Hurri­cane developed into a lethal tank-buster that was first exploited to the max at Alam el Halfa, where Rommel’s retreating Afrika Korps was bombed day and night.